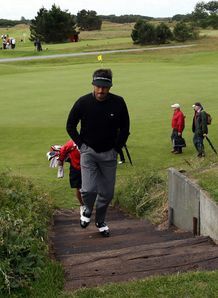 Jean Van de Velde made a last-hole birdie to secure his place at next week's Open Championship. Van de Velde was one of four players to come through the 36-hole final qualifying at Hillside with a one under par total of 143. The 42-year-old Frenchman pitched to within 18 inches of the flag on the 439-yard 18th. But that would have been of no use if his ball had not been found by a member of the gallery in dense rough right of the 17th fairway. "I might have taken eight on the hole, but managed to par it," said Van de Velde, who had asked for better control of the spectators after his opening 70. "The crowd were on my side both days, but just a little bit too close to my side at times. People are trying to communicate with you, but sometimes they were so excited they got in my way and I felt I had to say something." With only four of the 96-strong field qualifying for Royal Birkdale Van de Velde, absent from Carnoustie last year after contracting a virus, tied for second place with amateurs Chris Woods, from Bristol, and Australian Rohan Blizard, three behind Kenilworth's Jamie Elson. "It means a lot to be playing in it again. There are only two tournaments a year I want to play in and play good in - the French Open and the Open," he added. "I qualified in 1999 and played quite well I seem to remember, so maybe this is my chance." Van de Velde will forever be remembered for his last-hole triple-bogey seven at Carnoustie, when a six would have earned him victory. Paul Lawrie won the subsequent play-off. Elson, a team-mate of Luke Donald, Graeme McDowell and Nick Dougherty in the 2001 Walker Cup, won by three with rounds of 67 and 73. "I was as nervous as a cat all day," said the 27-year-old, whose father Pip was the European Tour's Rookie of the Year in 1973. It's great to get into the Open for the first time." Danny Willett - the former amateur world number one playing alongside Van de Velde - missed out by one after a closing double-bogey six. He hit a chip from beside the 18th green that failed to make it up the bank and rolled back to his feet. The Doncaster golfer has one more chance after receiving a late invitation to play in this week's Scottish Open at Loch Lomond, but he will have to finish in the top five to earn a place at Royal Birkdale. Irishman Philip Walton, Europe's Ryder Cup hero in 1995, finished top at West Lancashire three ahead of Scot Barry Hume, while 20-year-old Kent amateur Tom Sherreard and Weymouth club professional Jon Bevan tied for first place at Southport and Ainsdale. Australian amateur Scott Arnold, who led after an opening 66, fell away with a 78, while Scotland's Raymond Russell, fourth at Birkdale along with Justin Rose in 1998, failed to earn a return after rounds of 75 and 79. Bevan made it through for the third successive time and last year at Carnoustie made the halfway cut. Stockport professional Jamie Howarth parred the first extra hole at Southport and Ainsdale to qualify. Former amateur international Gary Boyd, from Northamptonshire, needed five more holes before he beat Middlesbrough's Jonathan Lupton for the remaining spot.